Background: Allergic rhinitis (AR) is one of the health problems in the world. 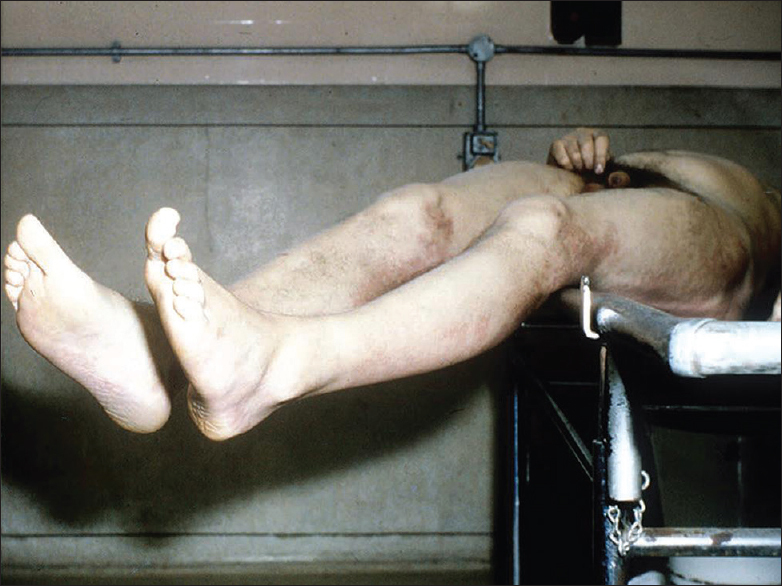 It is necessary to develop new treatment procedure for control of this disease. The aim of this study was to assess the effect of Zofa (Nepeta bracteata Benth) on AR patients. 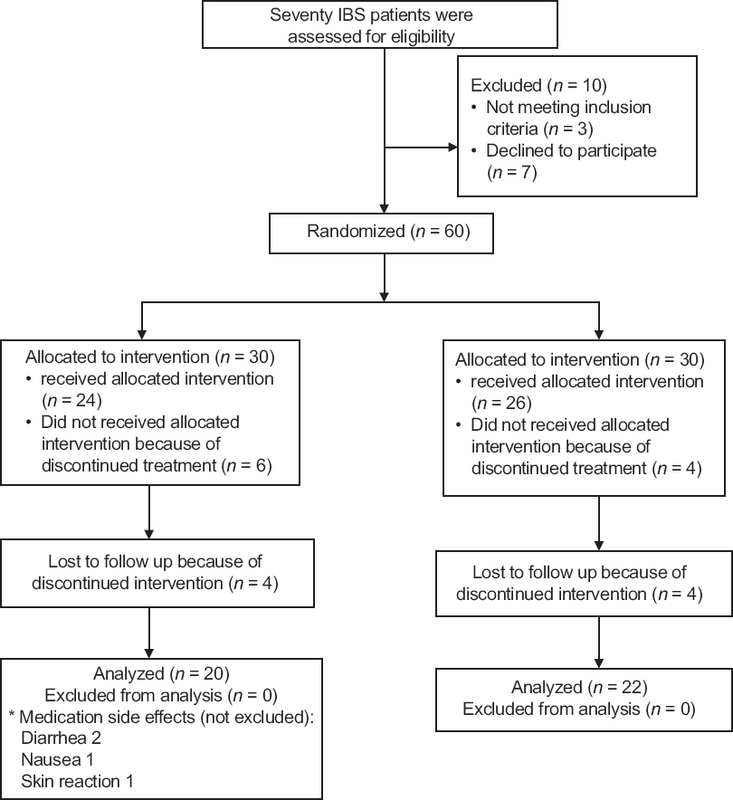 Materials and Methods: In this double-blind randomized clinical trial study, 71 patients (37 patients in treatment and 34 in placebo group) participated. In treatment group, N. bracteata syrup (NBS) was used for 4 weeks as three times a day. 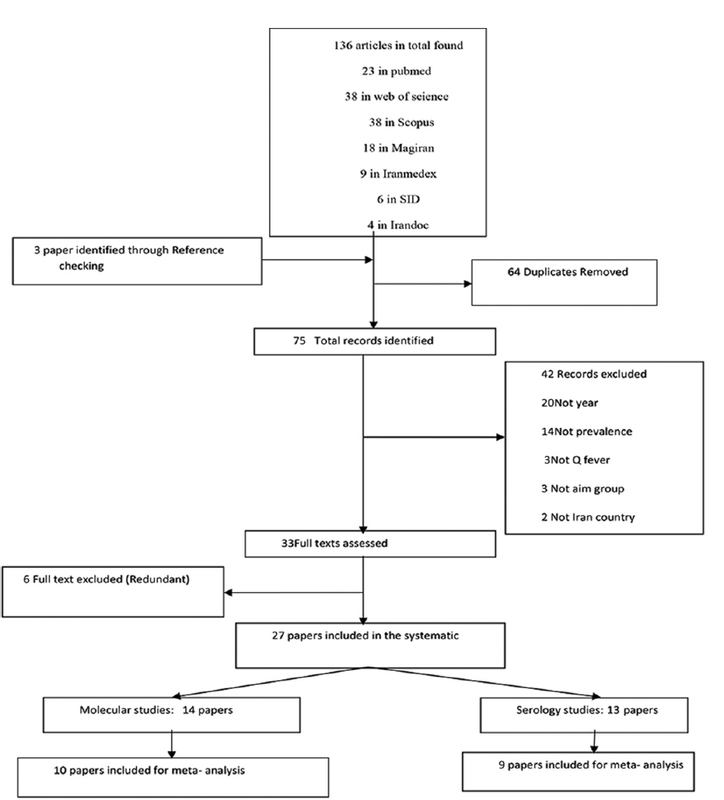 The efficacy of the drug regarding AR symptoms (rhinorrhea, sneezing, nasal obstruction, itchy nose, and ocular symptoms) were evaluated through a visual analog scale (VAS) by 0–10 before administration and at the end of the whole treatment period. The collected information was entered in the SPSS software (version 18) and was analyzed using the Fisher's exact test, Chi-square test, independent sample t-test, and paired sample test. Results: The improvement of AR symptoms in the group receiving NBS was significantly higher compared to control group (4.73 ± 1.84 vs. 0.38 ± 2.06; P < 0.0001). Furthermore, the mean of total VAS before and after the treatment (in case group) was 7.10 ± 1.92 and 2.37 ± 1.76, respectively (P < 0.001). Conclusion: The results of this study indicate that N. bracteata has significant effects on improving the symptoms of AR. Hence, it can be a good alternative to AR symptoms relief. Background: Findings from studies that investigated the relationship between fruit and vegetable intake with gastroesophageal reflux disease (GERD) were inconsistent. We aimed to assess the relationship between fruit and vegetable consumption and GERD among a large group of Iranian adults. Materials and Methods: In this cross-sectional study on 3979 adults, a validated food frequency questionnaire was used to assess usual dietary intakes including fruits and vegetables. The presence of heartburn sometimes or more during the past 3 months were considered as having GERD. Results: The prevalence of GERD among study population was 23.9%. After adjustment for potential confounding factors, those with the highest consumption of fruits had 25% lower risk for GERD, in comparison to those with the lowest intake (odds ratio [OR] = 0.75, 95% confidence interval [CI]: 0.59–0.97). Vegetable intake was not significantly related to the risk of GERD in crude or multivariable-adjusted models. However, participants with the highest intake of fruits and vegetables had 33% lower risk of GERD (OR = 0.67, 95% CI: 0.51–0.88), after adjustment for confounders. Women with the highest fruit and vegetable intake had 36% lower risk for GERD (OR = 0.64, 95% CI: 0.45–0.91). 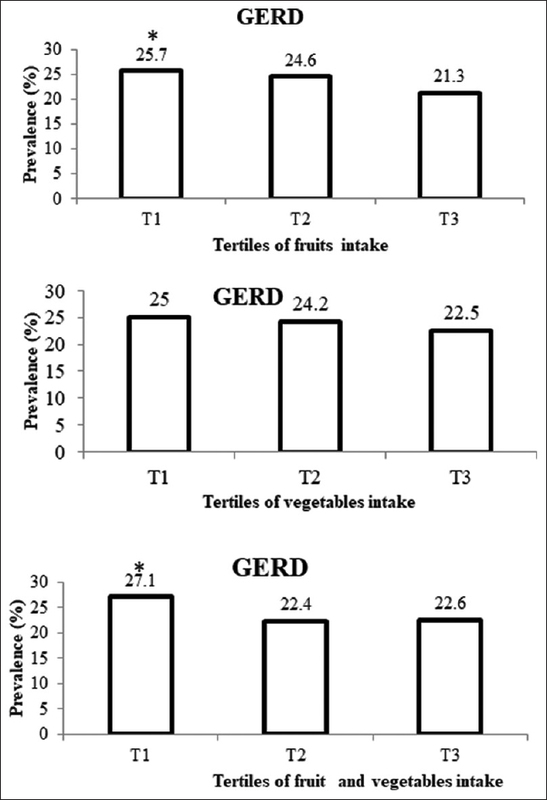 Overweight/obese participants in the last tertile of fruit consumption had 42% lower risk for GERD, in comparison to the first category (OR = 0.58, 95% CI: 0.42–0.83). Furthermore, participants with body mass index higher than 25 kg/m2 and higher intake of fruits and vegetables had 53% lower risk for GERD (OR = 0.47, 95% CI: 0.32-0.69). Conclusion: We found inverse associations between fruit intake as well as fruit and vegetable intake and risk of GERD among Iranian adults. Background: Irritable bowel syndrome (IBS) is the most prevalent functional gastrointestinal disorders (FGIDs) that affects in different aspects of life and patients experienced depression and anxiety more than others. There are several herbal medicines with positive effects in these patients. The aim of this study is to evaluate the effects of mixture of Boswellia carterii, Zingiber officinale, and Achillea Millefolium on severity of symptoms, anxiety, and depression in IBS patients. 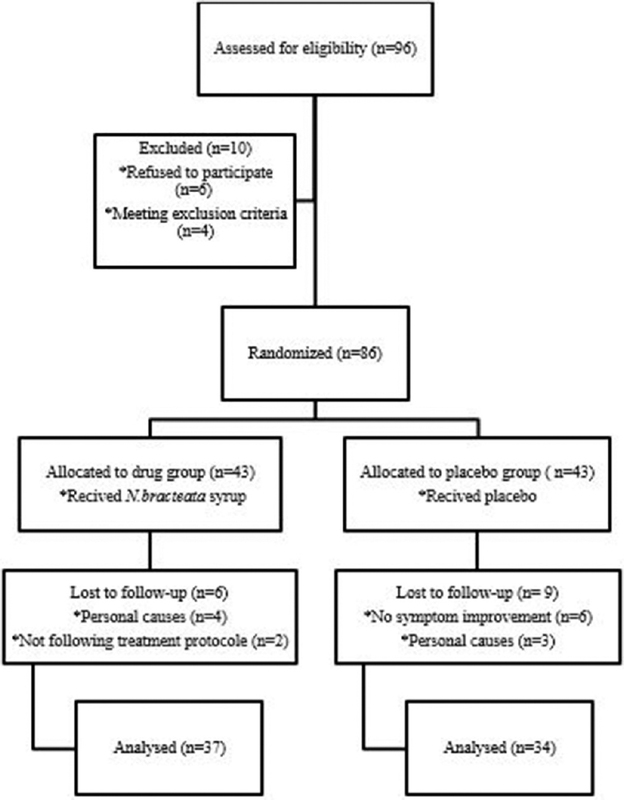 Materials and Methods: This clinical trial study was done in sixty IBS patients (with mild-to-moderate symptoms) divided into two case and control groups. Patients were assessed at the beginning, 1 month, and 3 months after by IBS-severity scoring system (IBS-SSS) and Hospital Anxiety and Depression Scale. IBS-SSS is used for quality of life evaluation too. Results: Sixty IBS patients (with mild to moderate symptoms) with a mean age of 38.75 ± 11.74 participated that 55.4% of cases and 72.8% of controls were men. The most prevalent type of IBS was the mixed type of IBS. 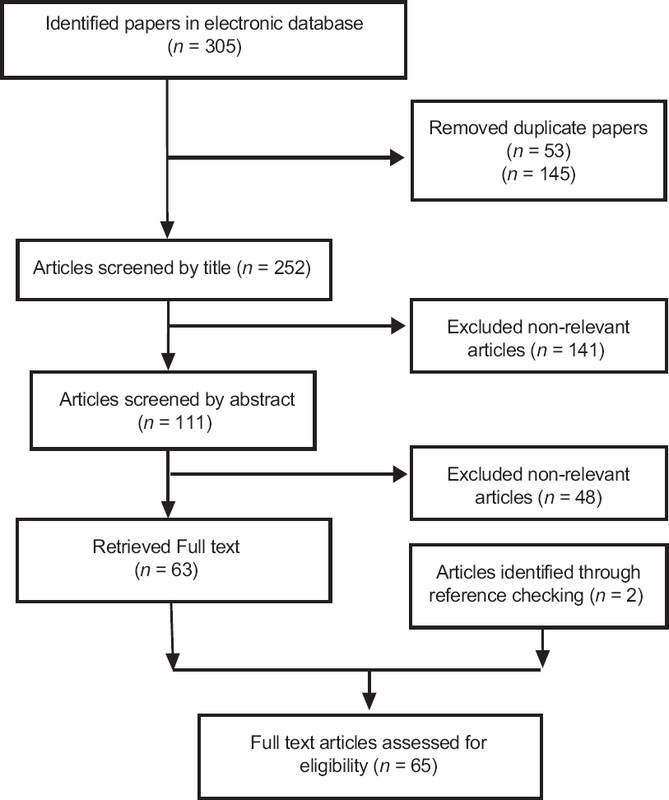 The mean score of abdominal pain severity and frequency, bloating score, and depression and anxiety score were decreased in patients administered herbal medication, but changes in these variables in controls were not statistically significant. The changes in quality of life score between cases and controls were significant in men (P = 0.01) although it was not significant in women. Conclusion: A mixture of B. Carterii, Z. officinale, and A. millefolium is effective in eliminating IBS symptoms and its related depression and anxiety and using herbal medicine in IBS treatment is suggested.